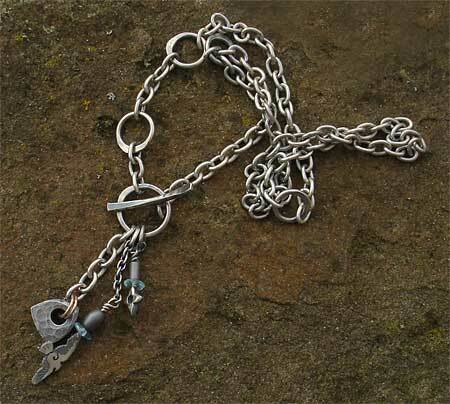 Alternative Silver T-Bar Necklace : LOVE2HAVE in the UK! 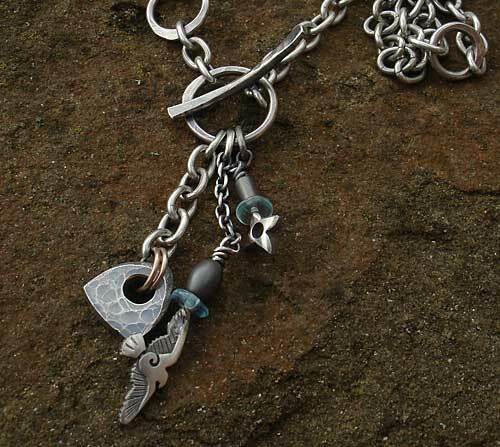 This alternative silver necklace for men and women is a lovely stylish combination piece which comprises of various beads and silver works to form an unusual and very eye-catching alternative necklace for men. Again it is from the Raven collection. We would describe this necklace as Y-shaped, made from a gently interrupted trace chain with forged jump rings and a T-bar catch to be worn on the front. Three different sized trace chain accents are dangling off the front holding onto hematite beads, a star, rose gold jump rings, a hammered logo and Raven bird detail. The chain length from the T-bar to the top of the large ring is 18 inches. The length of the Raven accent in total is approximately 5cm. All in all a great piece of women's or men's alternative jewellery.